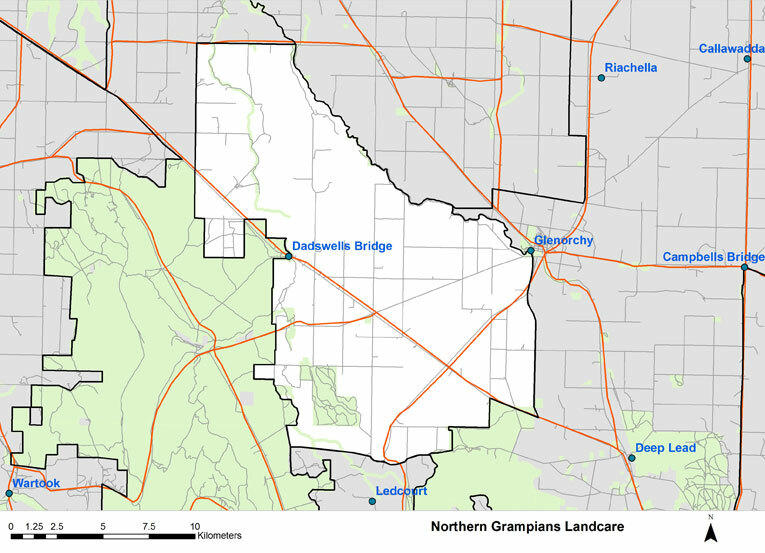 Northern Grampians Landcare are a diverse group of people with many years of experience between them. Sustainable agriculture and environmental land management has been the main focus for the group. Projects that Northern Grampians Landcare have been involved in are fencing off remnant paddock trees and protecting them from stock and establishing the next generation of paddock trees with ‘revegetation islands.’ Other projects the group have been involved in are the fencing and revegetation of roadside reserves and unproductive areas, establishing a nature corridor to join the Wimmera River to the Grampians National Park, erosion control work at Mount Drummond. Pest plants and animals have been a focus for the group, extensive warren destruction and fumigation work, as well as fox control has been carried out by group members. Environmental and agricultural weeds like Bridal Creeper, Cape Tulip, Blackberry and Briar Rose has been undertaken in the Landcare group area. The group constructed a walking track along the Mt William creek; they planted trees to revegetate the river bank, installed picnic tables in natural bush settings for everyone to enjoy the natural flora and fauna. The Northern Grampians Landcare Group look forward to continuing to care for the land and the community it supports.